…with a heavy heart… I am passing the reigns! 14-Aug-18 • Cindy • Comments Off on …with a heavy heart… I am passing the reigns! Do You Really Want to Do Your Own Gutter Installation in Gig Harbor WA? 20-Apr-18 • Mick Credere • Comments Off on Do You Really Want to Do Your Own Gutter Installation in Gig Harbor WA? 14-Mar-18 • Staff Admin • Comments Off on CR Gutters, Inc. expands continuous gutter installation service to the areas of Gig Harbor, Key Peninsula, Port Orchard, Bremerton and, Poulsbo. 1-Feb-18 • Staff Admin • Comments Off on 6″ Box style gutter by CR Gutters, Inc.
5-Dec-17 • Cindy • Comments Off on Why use aluminum gutters versus steel? How do you fasten the gutters to the home? Nails or screws? 10-Aug-17 • Cindy • Comments Off on How do you fasten the gutters to the home? Nails or screws? 5-May-15 • Staff • Comments Off on When it is a good time to install new gutters? 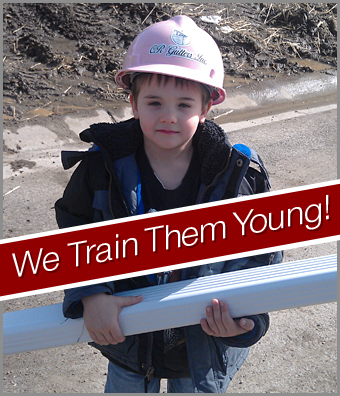 We train them young at CR Gutters since 1984!